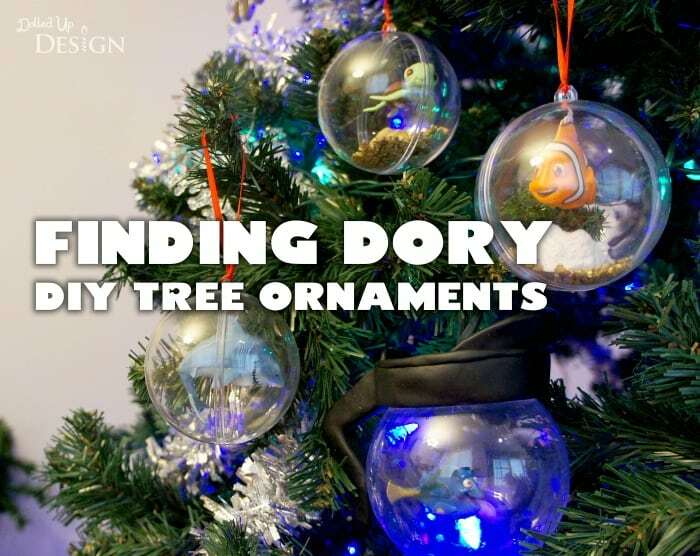 This Finding Dory DIY Tree Ornaments post is courtesy of our contributor Chantelle of Dolled Up Design…My DIY Mickey Mouse ornaments are by far the most popular post on Dolled Up Design. They are a few years old now, but they always get a lot of traffic and interest each year as the Christmas holidays near. 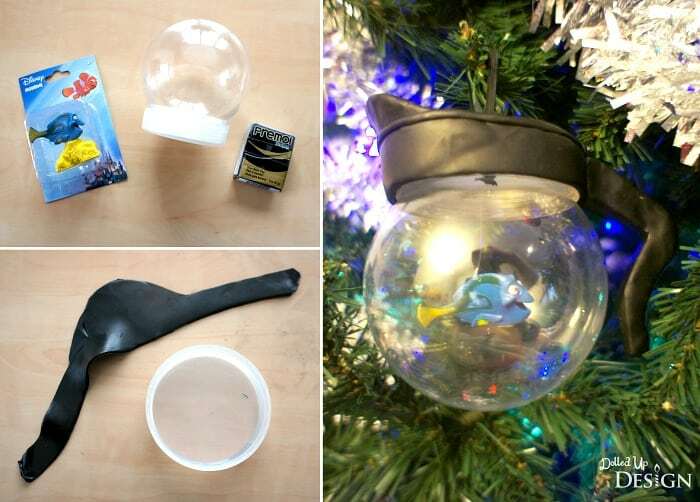 This year I wanted to come up with some fun new DIY ornaments for my fellow Disney fans. 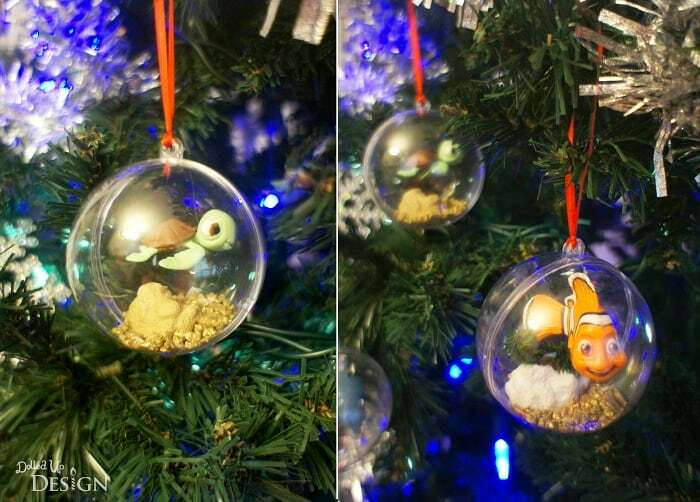 Since Finding Dory just came out on DVD, it seemed fitting to come up with some fun bubble inspired ornaments that capture these Pixar favorites. 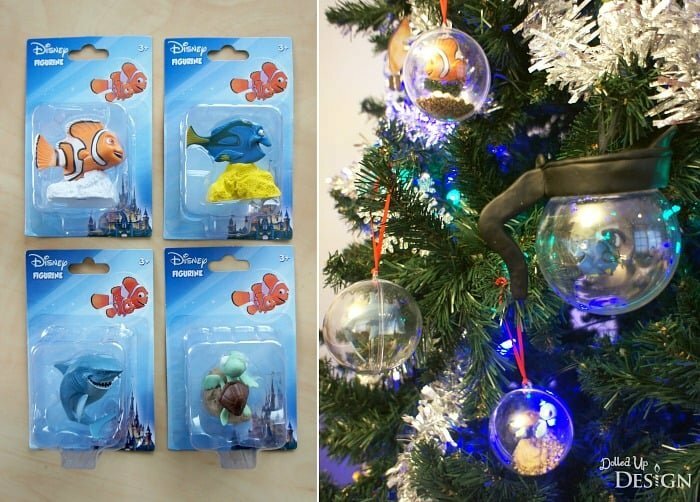 To make my Finding Dory ornaments, I used these great figurines I came across at Dollar Tree. A second option I was considering was to buy the Finding Dory version of My Busy Books and using some of those figures. I decided to put each of the figures in a round plastic ornament ball since they reminded me of bubbles just like you see throughout the movie. Make sure you get the photo ornament balls that split right apart so you have room to get your figures and accessories in. I was happy to discover I could easily break the figures off their rock/coral stands and decided to hot glue these to the bottom of each ornament. 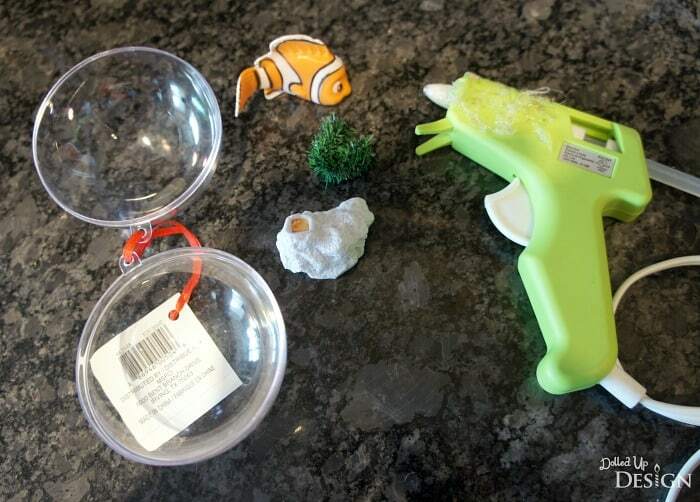 To have Nemo and Squirt appear like they are actually swimming in the bubbles, I then decided to suspend them in the ornaments with fishing line. For a finishing touch, I also poured in a bit of decorative rock before snapping the ball halves back together. 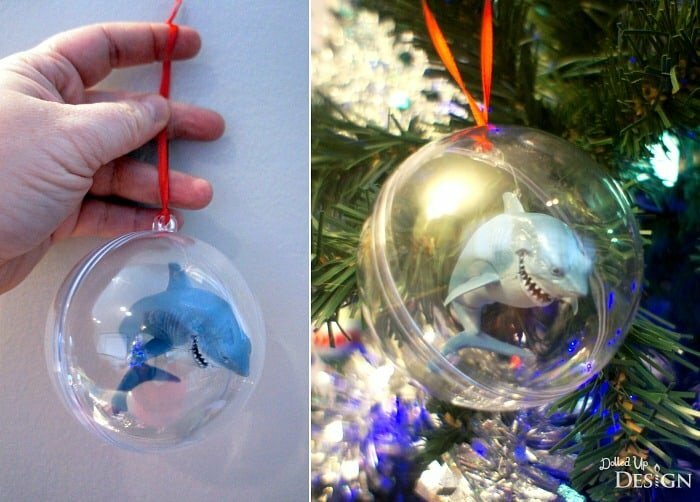 When it came to Bruce the Shark, I kept things simple and just poked a small hole through his fin to hang him within the ball. As with my other ornaments, I tied the other end of the fishing line to the top hole the hanging ribbon runs through. One of my favorite parts of Finding Dory is Hank the Septopus carrying Dory around in the coffee pot. I saw an ardorable glass coffee pot ornament at the Disney Store and knew that it was something I wanted to re-create. To make my coffee pot, I used an empty snowglobe base I found at Michael’s. I knew the wide round bottom would work well to build my coffee pot spout and handle around using black Fimo clay. Once sculpted, I simply baked the clay handle right on the snowglobe lid/bottom. When cooled, I drilled a small hole into the lid and strung my plastic Dory through using more fishing line. To finish it off, I added a nice black ribbon for hanging on the Christmas tree. 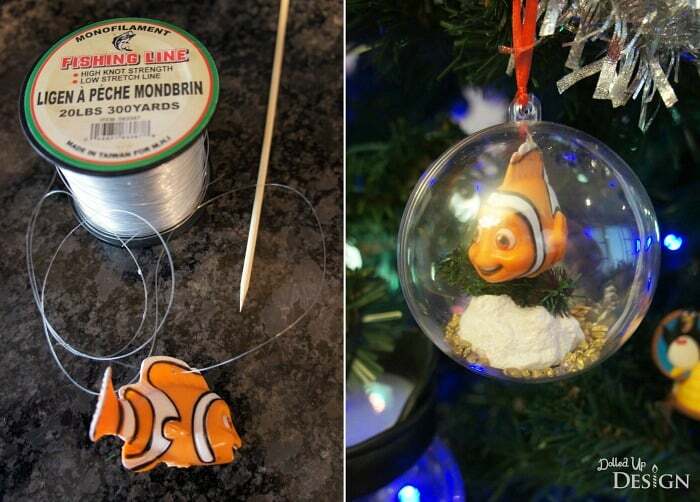 These ornaments were quick and inexpensive to make, and are sure to please any Nemo or Dory fan. I love that the characters appear to float and swim within their bubbles and they look great hanging amongst all the other great Disney ornaments on our Christmas tree. We’d like to send a big THANK YOU to Chantelle for sharing this adorable idea with us! Her parties & crafts are always easy to recreate and kids love them! Be sure to follow her on Facebook to stay updated on all her fabulous ideas.